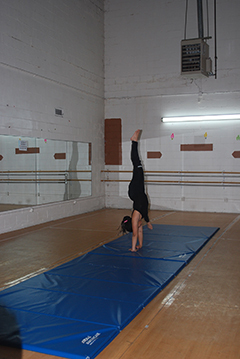 Dancers learn gymnastics movement without the use of apparatus. Dancers learn forward and backwards rolls, front and back walk overs, front and back handsprings, back tucks, etc. Dancers learn gymnastics movement without the use of apparatus. Dancers learn forward and backwards rolls, front and back walk overs, front and back handsprings, back tucks, etc. Girls are required to tie or pin back their hair away from the face. All Jazz and Tap students must wear black leotards, black jazz or tap shoes and jazz pants. All Modern students must wear black leotards and jazz pants. All male dancers must wear white T-shirts Black ballet shoes and black sweat pants. If a dancer is not in proper attire, the dancer will be asked to sit and watch class. Not having the proper attire can cause injury, and observing is another form of learning. Get our regular email of featured events and news. © 2019 copyright Beachfront Dance Studio. All Rights Reserved.